Ruby Stevens AKA Barbara Stanwyck - Not bad for a girl from Brooklyn!!! The movie leads were Babara Stanwyck and George Brent. Barbara is superior as always and George is as dependable as always .......a very nice little movie about a widow trying to make a life for herself and the town gossiping about how she is going about making that life!! The supporting cast is headed up by Lucile Watson - that indomitable actress of the late 30's and 40's who played the dominating mother figure to many. Last night I spent working on and exchange and a little on BPC. I chose the fob that is red/green and have already attached it to my favorite Dovo scissors. i think I will work my section in the darkest purple. I need to get Carols piece finished up and then start working on Wendy's. That's about it for today - Thanks for stopping by!! 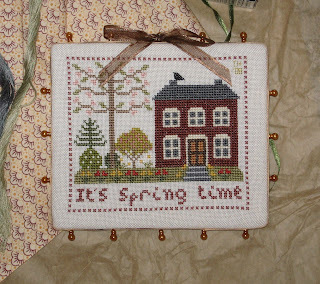 I stitched Geranium House by LHN and then turned it into a box. I think it turned out pretty good for the first time trying. I also included some extra goodies but didn't get a snap of them Tulla has posted more snaps at her site. I really enjoyed stitching this chart as geraniums are one of my favorite flowers!!!! Sorry it is a little wonky at the bottom, it really is supposed to be a straight line. and I know it will only go up! My little rant for the day! Hope everyone had a great weekend!! Thanks for stopping by! I am going to hold off on any initials until the end and see how I feel about what should go where. This "Moss" silk is really VERY nice and works up a dream!!! On the lower unfinished motif I was off by one stitch so I had to pull the entire thing out up to the little leaf on the top right - if it hadn't been for that I would have been quite a bit further. Vonna had asked what the linen is and I really do not know. I won it on eBay when I was going after an OOP chart and it was included in the lot. It was a much larger piece as there was some design being worked on it. I cut that off and had the edges surged. The only thing I can say is that it is 32ct, and splotchy, so I would presume it is hand dyed. I have been saving it for a really long time to work something large on it and that is how it came to be the BPC linen. The movie last night was "Talk of the Town" - 1942 - with Jean Arthur, Ronald Coleman and Cary Grant. A really top notch movie and really worth the watching. Basically a movie about an escaped convict, mob rule, insurance fraud and justice. We also watched both "Ugly Betty" and "Grey's Anatomy" - they were finally both new and not repeats and quite entertaining. Didn't Vanessa Williams look great last night!!!! I will leave off the week with a snap of Pete and Hunny. but I got the man dog and our "Frosty Faced" little lady!! Have a great weekend, and Thanks for stopping by!!!!!!!! them? Do you have another option for blends to share? For me whenever I need to use a blended thread I will blend as the need arises and use them up as I go. If I do save them it is only for the duration of the project and they are in little floss-a-way bags. since both are now on DVD they are easily accessible. Also after "Murder" was released and made a ton of money it was followed by two more super star mystery flicks - "Death on the Nile" - 1978 and "Evil Under the Sun" - 1982. All three are super movies are packed full of real movie stars from the golden age of film. All worth seeing over and over!!! Sorry about the "no snap" but I will try again later or tomorrow morning. I think I will really like working on this a whole lot!! It has many of the bells and whistles that do it for me - 1) splotchy fabric , 2) 32 ct, 3) the floss is a really nice grey/green and 4) it is a big Quaker thing!!! I am stitching it as charted, so if you look on the upper right bar it is pretty jagged and not straight, charted that way and it is not offensive - I have in the past and will continue to stitch or rechart something if there is a mistake and it doesn't look right. This weekend was a very low key weekend. All around the city there are signs of spring and even on my little street the trees are doing their best. Here is a snap right outside our door. These trees are just beautiful this time of year and will probably only be around for another week or so. I took Saturday off just for a break and we made a trek to NIAH to pick up some silk I had ordered. (I was going anyway, but the silk came in so I an excuse now!!) I have been meaning to take a snap of the place for the longest time and I finally remembered to take my camera...so here is a snap of the front with Mary unlocking the door. It is really hard to tell but the linen has some red blotchy places that will coordinate with the BP piece really well, I think. I took the sweet sheep pillow Su sent for the SBEBB exchange and everyone was so impressed with all those little knots and the great finishing!!!! In honor of Passover this weekend I made some Matzo Ball soup. I had never made this type of soup before and have always loved it so here is my first attempt! We really liked it and it tasted right to this Presbyterian!!!! 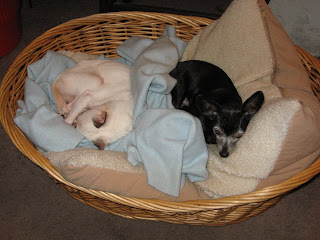 It is often a race in the evenings once I sit down to stitch to see who sits up here.... the Peach is the usual suspect. 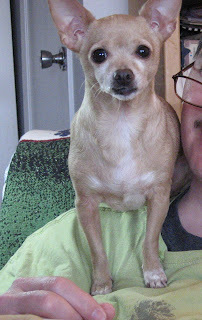 I think she waits around to see if I will pull out some stitching and then scoots right up on my shoulder. Then at the end of the evening or when she hears me popping the q-snaps she wakes up (she will eventually lay down and fall asleep up there) and then runs on upstairs to bed. It is a nightly routine. I can't show any of the stitching or finishing I completed this weekend as it is all for upcoming commitments and I don't want to spoil any surprises. Thank you all for the really nice things everyone says!!!!!! The pattern is by Ewe & Eye & Friends and is called "Ewe Alone." It is really just so sweet!!!!!! The package also contained three cuts of lovely fabric for finishes and three skeins of overdyed floss from Polstitches Designs from Wales. I have seen mention of this company but never been fortunate enough to have any. Thank you so much for the lovely exchange!!!!!! Aren't I a lucky stitcher!!!!! What a great start to the weekend. I am off to NIAH tomorrow as I really need a fix!!!! No new stitching snaps. No fun mail. I placed a couple of fun orders yesterday for silk and some linen - but no snap. 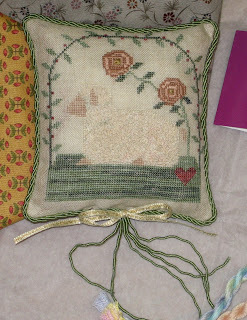 I did add to my wish list some pics of things I found at the on line needlework show. Here’s a little meme about stitching habits that I found on Kendra's blog. How do you hold your fabric? I toggle back and forth between my right and my left hand with the project q-snapped. It depends on if the floss is going in or coming out. Floss licker? On the end to thread it – I usually use some thread conditioner that I will pull the floss through. How do you thread your needle? I lick the end, snip a clean cut and just stick it through the eye of the needle. What needle do you like best? J. James gold plated #26/ #28. Are you a needle loser? I have yet to loose one…usually the plating will were off or I will bend it......and I will toss it out. Bobbins or floss bags? Bobbins for DMC – and in storage boxes, over dyed cotton on separate rings by company organized by number or color depending on the company, silk in Floss-a-way bags on rings. Do you do your own framing, and if so, do you lace or pin? I have never framed my own stuff; I really don’t feel I could do it properly. Are you a floss floozy? Yes, I just can’t pass the stuff up and have gotten into trouble over this weakness. The pile continues to grow. Silk? LOVE IT!!! !Love the look, feel and the way it stitches!!!! Are you a pattern or designer snob? Not at all. If I like a pattern I like it regardless of designer. 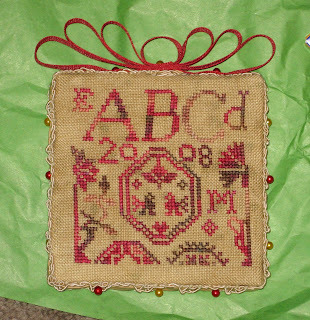 Do you get antsy when you give someone a stitched gift? It depends on the occasion and what I have stitched. For exchanges I worry the least. Have you reached S.A.B.L.E.? Probably, but that will not stop the buying one little bit….!!! There are way too many things out there!!!! Thanks for all the encouragement about the sewing machine, it is amazing how many of those that are out there.... I am following a couple that look promising. Have a great weekend, thanks for stopping by!! I worked on "This and That" last night. I set as the goal last night the half way point and finishing the crown - and achieved it - woo hoo!! and that is why we watch them!!! The on-line Needlework show opened yesterday and my list of greed grows and grows!!!! There are way too many things I want and way too little time to ever stitch them. I will throw them on to the wish list just to keep up.... but where will I ever find the time to stitch them??? Going through the list of exhibitors and on their sites it is amazing how much variety there is out there. I don't like everything but then I don't think anyone could with all different styles, colours and subjects...I think there is just about something for every stitcher available. I am posting my exchange today and it should arrive in a week or so. Mary from over at NIAH was over yesterday helping Rico with a costume and brought over the greatest little Singer sewing machine from the 1930's... I need to acquire one of those tabletop, built to last marvels!!! The machine we have is so modern and plastic that it has of course broken or I should say the peddle arm has frozen up and we need to get WD40 to hopefully loosen it so that we can use it again. I hope this finds everyone well, thanks for stopping by!!!!!! I certainly do not understand the attraction for the Manga Genre, but I know how popular it is with the teens and tweens. We also, once again had dinner at the Mall - don't you love that orange chicken from Panda Express!!! Now they also have a new Beef something and Rico got some of that - it is pretty good also. When we eat at the food court, we either eat at Panda Express or at the Hot Dog on a stick place. Not just for the hot dog but they yummy lemonade!! I also finished the SBEB - Spring House and Garden and have that sucker packed up ready for mailing tomorrow. It has a really long way to go so I am mailing a bit early, I hope my partner enjoys it as I really enjoyed making it up. Last night the movie was "Broadway Melody of 1936" - 1935 - with Eleanor Powell and Robert Taylor. A really nice musical which is short on story BUT long on music and dance!!! I really liked it and will watch it again. The Vaudeville brother sister team of Buddy and Vilma Ebsen were really something to watch. It is interesting to imagine what could have come of Vilma if she had pursued a career in film and hadn't retired from after this one. The stitching evening was spent on the search for a pattern and stuff...I spent over an hour an 1/2 looking and re-looking through stuff for a chart. I did eventually find it stuck into another kitted up chart. I would look, get frustrated and then sit and think of where it could be!!! Doesn't that just drive you crazy!!!!! I knew I had put it up for safety as it is an important chart, in fact it was my chart, notes and recharting for the QFRR that I am in. After I found the chart it was so late and I was in no mood to stitch I just sat there a finished and enjoyed the movie!! It is at a weird angle because it is a large piece and under glass and the reflection was very odd, but you get the idea. I worked almost exclusively on exchanges last night after getting home from shopping and dinner out - woo hoo no dishes to do - let someone else clean up!!!!! it was a no movie night - the history channel had a get show on the titanic luxury ships from Lake Nemi built by Caligula....... I was just fascinated so I watched that. I worked a ton on exchanges so no snaps of those, yet. I also worked some on "This and That." Here is a progress snap. It is a pretty boring picture but now I will work along the top. There is a box that goes between the triangular hearts and this leafy band that I will put my moms initials and the date, I re-charted them to fit here. On the tops of the gates I will put my brother, sister and my initials. I also watched some pretty good movies - Friday saw "Crash Dive" - 1943 - pretty good propaganda film about a sub, a girl (Anne Baxter) and a evil Nazi ship base in the north Atlantic. Saturday was a double feature starting off with "My Favorite Wife" - 1940, starring Cary Grant and Irene Dunne. A wife presumed dead comes back to find that her husband has remarried. Very good film!! The second flick was "Halls of Montezuma" - 1950 - about a group of marines against an evil Japanese rocket base. A different kind of war film with lots of background for each character...staring Richard Widmark. Last night was TCM salutes musicians - with "Rhapsody in Blue" - 1945 a fictionalized film of the life of the brothers Gershwin. Great music but a silly story. Staci asked what the pattern was that I used for the Pyn Keepe exchange - it was a modified Willow Tree Inn by LHN - I cut off the top part of the chart and finished the border around. Vonna - of course you can use my antiquated spelling of Pyn Keepe. I saw it spelled that way somewhere and liked it so that's the spelling I use. Like you, if I like a pattern enough I have no problem stitching it again and again. Thanks for all the nice comments everyone left and for stopping by!!! isn't that some great paper! Here is the whole super package!!! Shelley made the most lovely piece using Thistle Threads "Miniature Quaker" pattern using Silweavers beautiful "Sandstorm" linen with Cherry Wildflowers silk (I love those Quakers and cool muted colours). The finishing is perfect and fits in so nicely with my growing collection of Pyn Keepes . 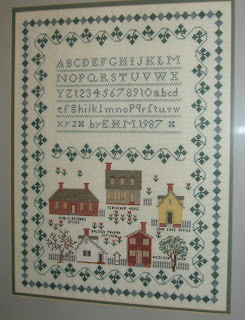 The extras she included were a chart by Milady's Needle - "Quaker Christmas Smalls" (a chart I have seen but did not have and wanted!!!!) Also included were two skeins of floss - Waterlilies "Arabian Nights" and GAST"Cranberry"(again I just love muted darker colours!! ), two pieces of 32 ct linen - in Chestnut and Blue (32 ct is my favorite ct to work on), a fun piece of fabric for finishing, a note pad with stickies and some fun Glee Gum, Tangerine Flavor! Thank you so much for this wonderful package!!! I have been so spoiled!!!!! This is of Saint Thomas Church in the little town of Bath, NC. I worked in the Blount -Bridgers house in Tarboro right out of ECU so I knew all the sites on the Albemarle tour very well. The movies last night were TCM Star of the moth selections featuring Hedy Lemarr. The two features were - "Ziegfeld Girl" - 1941 and "H.M. Pullham, Esq. " - 1941. Both very entertaining movies. ZG also has Judy Garland and Lana Turner, very pretty film with some big production numbers by Busby Berkley. HMP is really a very good film and was Hedy Lamarr's favorite film of all she did. Have a great weekend - and thank you so much for stopping by!!!!!!! There you go, a title that will drive me crazy...adding an "e" to something just about drives me nuts. That's just me and one of my craziness'!! 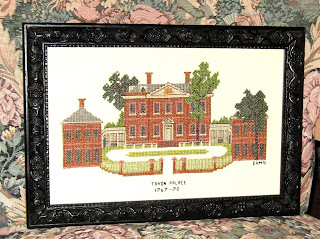 Exchange week continues and the snap today is of a lovely reconstructed "Palace" from eastern North Carolina, my "olde" stomping grounds. Here we have Tryon Palace, or the reconstruction of Tryon Palace a Colonial Governor's residence. Only the right wing or stable wing survives from the original construction as the main house burned in the 1790's and the left wing was pulled down in the early part of the 19th century. All that aside it is a wonderful site located in New Bern, NC and NB is such a nice place to visit that it is worth the trip. The Gardens behind the house are also lovely and worth the time to explore. They do a super job of interpretation inside and out and the guides are very knowledgeable. New Bern itself is charming and easy to navigate with lots of things to see and do. Becky asked if I had stitched the Biltmore chart I haven't, and I don't know why - as I had one for the home for the longest time. If you are not familiar with Biltmore it is a house from Asheville, NC that is just wonderful and a true American Palace in the French Renaissance taste. The flicks last night were - "Valley of the Dolls" - 1967 - two things to take away from the movie.....drugs are bad and power corrupts (surprise, surprise!!) At the time this was made it was a pretty shocking movie - 40 years later it is less shocking and more campy. The second flick of the evening was "Van Ryans Express" - 1965 - a movie I had seen a long time ago - it is about a train load of mostly English soldiers trying to escape German held northern Italy in the waning days of WWII. A pretty good action film and never dull, starring Frank Sinatra and Trevor Howard. My yesterday evening in a nutshell!! Thanks for stopping by! 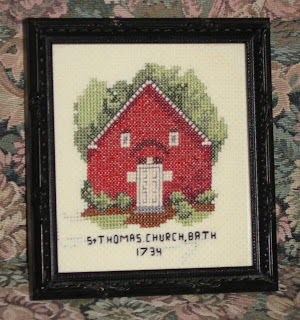 I worked on exchanges last night so I have another older piece to show that I stitched in 1987. Here is a snap of a "Middleton Place." This is a lovely home north of Charleston, SC on the Ashley River. One of the undergraduate degrees I took was in Historic Preservation and I have always been interested in beautiful old buildings and so I stitched some of the ones I visited. The movies last night were "Anzio" - 1968 An entertaining film if a bit wanting. Although I think it was trying to be big budget and all that it actually comes off a bit flat. This film is very anti-war and drives the point home on more that one occasion. The music is also very odd for a war film sort of groovy 60's orchestral.... for s way film it just did not fit. The second movie was "Hit the Deck" - 1955 - a light musical remake of "Follow the Fleet" - 1930. Although from the MGM glossy dream machine it is a weak film. Entertaining enough but it is not a "Singing in the Rain" or "Brigadoon." I did have a question the other day from Monica about where I started Quaker Christmas as she has gotten Quaker Virtues. I started in the middle, I always start in the middle as I don't feel confident enough to start in the corner. It was the way Louann tough me to stitch and I just have never tried another way. BTW - I also have in the stash pile Quaker Virtues and it is calling to me - stitch me -0 - stitch me - stitch me........ but in what on what that is the question??????? That's his favorite blue blanket and whoa be to thee that touches it!!! I worked exclusively with an exchange last night and will for the next few so no pictures of that , yet. I do like to post stitchy snaps so here is something I made almost 20 years ago when I first stated to stitch. I have always liked those family registers and I think this chart was in a magazine. It is done on Aida (I had not even heard of linen at that time) and with DMC floss. It shows my brother sister and I then my parents, grandparents and great-grandparents. If I was to redo this now I would make many changes, but at that time I was a slave to the chart. I also would frame it differently, but them's the breaks!! The flicks last night were a tribute to 1933 and the 75th anniversary of King Kong (which I did not watch as I do not care for that picture) But, I did watch "Dinner at Eight" such a wonderful picture and a follow up to "Grand Hotel" the year before. This was followed by one of 3 incarnations of "Little Women." I really like this story and find that this '33 version very superior with Katherine Hepburn as Jo, the 1949 version with June Allison playing Jo is good but not as good. I also got the Volume 3, Classic Musicals from the Dream Factory. There are some great movies and some wonderful double features. I also received, from a friend who knows I really like Bette Davis, the second box release for her birthday from 20th Century . Wasn't that a nice thing to do!!!!! I was wondering if I really needed the second box, and probably would have gotten it at some point, but now I don't need to worry about not having to go out and get it!!! Well, did we all get a giant amount of Bette this weekend?? Such a nice line up of flicks. I started of the weekend with "Deception" - 1946 on Friday night. This was a movie I had not seen before and came in the Vol 3 set. What a great flick. With Paul Henreid, Claude Rains and Bette. The same three mains as in "Now Voyager" - 1942, but with very different story lines to follow. Claude Rains is very evil and kinda whacked but VERY good. If you get a chance you should rent this as it is worth a look. Then we go into Saturday, watched most of "Corn is Green" - 1945. An adequate film, that was remade in 1979 with Katherine Hepburn in the Miss Moffat role. The KH version was better as more believable. The supporting cast in 45 was better, but thats just my opinion. Then we took off for a run to Alameda to visit NIAH. Picked up quite a few things that there is no snap for. Then is was back to watch the afternoon and evening flicks. Then last night I rounded out the weekend with "All This and Heaven Too" - 1940. I really like this film as it has Barbara O'Neil going over the hysterical edge, a true nutburger!! She is married to Charles Boyer and Bette plays the governess in their noble house of crazy!! It is a beautifully filmed work and worth the time as it is one of the longer films in the box set. I worked on two exchange pieces, finishing one and getting a good start on the other, no snaps. I also worked on "This and That." Here is a progress snap. I will put this away this week and finish up the exchange piece. There you go, thanks for stopping by!!! As you can see I finished the swan and she is floating on a sort of swamp coloured ground sniffing a brown flower. The half pot above is matched with the other half on the other side. I really need to put some time in on this as I want this finished some time in the early summer late spring... how ambitious is that!! :) I also want to get back to VoHRH - you haven't seen that piece in a good long while - but if you remember I am at the little white church - and I do not like stitching white - some sort of weirdness on my part, but there it is. We usually go to the store on Thursday for the next weeks grocery buying and yesterday was no exception. Since this is a between time for fruit most of what we have been getting is from Chile, and is pretty good overall...but I have been waiting to see some things coming out of the San Joachim Valley. Yesterday there was a small display of California Strawberries that looked just great. So we got a container and an Angel cake and since the squirt creme was two for one - you know I got two!!! Yea... for the summer desserts!!! Even the weather cooperated as it was in the mid 60's and we opened up the sliding doors onto the balcony to let in the balmy breezes (as opposed to the arctic blasts we usually get) It is supposed to be even warmer, in the high 60's, today. I am in the mood for some nice weather and may even get to Golden Gate Park for some walking time in tomorrow. My blowing off steam yesterday about the bad experiences I had with some ONS, it was just me venting an opinion. We can all pick and choose who to support and not with where we shop and spend our ever dwindling dollars. I didn't want to name names as I have seen on many blogs the great experiences that others have with various ONS and did not want to slam a store/site that someone else likes and has never had a problem with. I can only relate my very bad experiences. I have always had very good relations with Drema at Needlecraft Corner, Vicki at Hand Dyed Fibres and Mary (or anyone for the matter) at Needle in a Haystack. 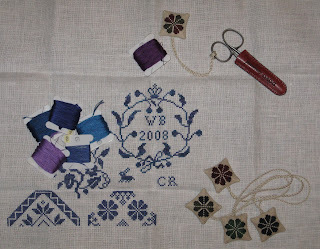 So I will stick to my three sources for stitchy stuff. Thank you all for the really nice comments about "This and That." Thanks for stopping by!!! The movies last night, as I can't even watch ANTM anymore, were "The Europeans" - 1979 and "Goodfellas" - 1990. "The Europeans" is from a novel by Henry James and is a lovely movie starring the ever beautiful, and sadly gone, Lee Remick. Wonderfully acted and a gorgeous period film. The second flick was "Goodfellas" a great gangster film based in truth. What a great film!! A bit bloody but well acted by a big ensemble cast of well know and not so well know actors. I really enjoyed this film and will watch it again. Makes me want to go a re-watch the Sopranos, which is one of my favorite shows of all time!!! Both films I would highly recommend! I finally received two charts I have been trying to get for the longest time. For some reason I just had a hard time getting these charts. I ordered HH from a OLNS (I was trying a some new places to see how they operated) well I waited and waited with absolutely no response. After over a month and the third ignored email I charged back my CC and placed the order with Drema at Needlecraft Corner and slam bang it got here in a week. The HB chart for some reason I was having the same problem with. I placed the order with an OLNS a different one as I was trying out different places, and again waited for over a month and again nothing. I tried to email, bounce kaboing!! return email. Then tried all three of the listed numbers and none of them were ever working or I should say would either cointinuosly ring or not even connect. After about a week of this messing around - slam another cc charge back. Then I placed the order with ABC Stitch Therapy. This was a bit better.... but after waiting about three weeks without a word form them after placing the initial order, I wrote them an email (and got a response) and was told they were waiting for a back order from Canada, which is fine, except I would have thought they would have alerted me to the backorder and not wait for me to inquire. I am a pretty patient person, but geez let a person know whats going on. It finally arrived and the lesson learned is to stick to the LNS and OLNS that I know and that will come through for me. Those other two unmentioned OLNS will never hear form me again, I might order from ABC ST again.... but then again I probably wont as I know that I can get anything from Drema that I might need or even locally if I am going over to NIAH, so why bother....... Live and Learn!! As you can see I have finished the little poem and need to work the fences and the surrounding vine. Some mail, some stitching and a treat! Yesterday the mail was very good to me!!! As you all have come to know I do enjoy a good movie on occasion! :) Well, this Saturday April 5th, is the Birthday of one of my favorite actress', Bette Davis. In fact it would have been her 100th. Yesterday, April 1st was the release date for the Bette Davis Volume 3 movie set!!! I have had this marked on my calendar for months and had it on order for at least 2 months. It came yesterday. The set included 2 of my all time favorite BD movies. "Old Maid" - 1939 and " All This and Heaven Too" - 1940. Such a great set!! There is also being issued and 100th Birthday set of some movies. What is so sad is that half of those in that set are already out on DVD and that is so unnecessary as the BD movie portfolio is still packed with titles that are not out on DVD. Last nights viewing included "Old Maid " - from the novel by a great American writer, Edith Wharton. Absolutely worth seeing over and over again. If for nothing else than to see Miriam Hopkins and BD go at each other and try and out do each other chewing up the scenes!!! The other movie on the bill was "Cromwell" - 1970. A very good movie that is not all that accurate but Alex Guinness as Charles I is VERY good!! Pretty lavish and entertaining. I worked on "This and That" and here is a progress snap. The little bit of lettering I had done I pulled out as I felt the stitching was very thick. I am now doing the lettering 1 over 2 as it seems less thick and easier to read. With the BD collection I got a copy of "Scrooged" - 1988 as a Christmas treat for myself. or it could be that everyone has the chance to change the way they are and if it takes having the be-jesus scared out of you then that's what it takes!! The movie was "The Girl Next Door" - 1953 with Dan Daily and June Haver. A bright and really watchable musical. Very different kind of musical for 20th Century. It is about a single widowed dad raising a son alone with a beautiful nightclub singer next door. Wonderful musical numbers that are not typical of the 50's musical machine. Very good movie and worth seeing. I had never heard of it and it was a great surprise for me!! I really need a snap of something here.... how about a sweet puppy shot???? She thinks she is ferocious, but is really just a love bug!! I have had a hard time lately getting to all the blogs I usually read so don't think I have forgotten everyone - it has just been so busy around here!